We have dedicated the past year to making PC*MILER work for you. 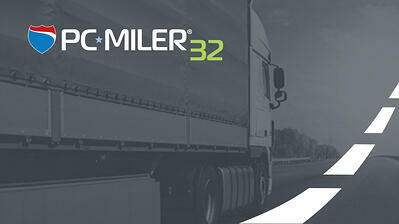 With your best interest in mind, PC*MILER 32 utilizes new cloud technology and enhanced functionality. Easily create and manage custom content and share that content with colleagues for more efficient and consistent operations. Custom Content. Seamless Sharing. Enhanced Efficiency. New web-tools for custom location and route management control. PC*MILER 32 introduces ALK Content Tools, a cloud-based web-tool that allows users to create, manage and share custom location (previously Custom Places) and route management (previously Avoids/Favors) content. Gone are the days of exporting and importing custom content between versions! With PC*MILER 32, now all users on a single company account can access their custom content for operational consistency. The new Site Manager in ALK Content Tools allows users to enhance custom Places by drawing a boundary polygon around its perimeter and adding truck entry and exit gates, called a “Site”. This creates more accurate mileage and drive time calculations, as well as and more precise driving directions. Updates. Updates. And more updates. Road network updates and faster route insight with enhanced workflow features. As always, our team of dedicated GIS professionals update and verify roadway attributes for height, weight and load restrictions. In addition, users can now easily generate the Mileage report for trip leg and overall miles, better understand weather alerts with streamlined alert categories, and view the additional distance impact when inserting a fuel, HOS, or other stop along a route. New helpful resources, now available right in the Help tab. Watch our quick, two-minute video tutorials on the new Product Training Resources page to better understand all that PC*MILER offers. Get a guided tour of the latest version with our User Guide that is now easily accessible on our Support site; remember to utilize the search bar to find what you need fast. Our comprehensive online library is filled with FAQ’s and articles that can effectively answer any question.